Elena is one of the newest Princesses on the Disney Channel. On her show, Elena of Avalor is learning to navigate her role in the kingdom. This new DVD Celebrations to Remember features 4 holiday episodes. We've really liked watching to learn about holidays we didn't really know about like Carnival. One of the conflicts they work through is how everyone has their own traditions and how to mix it up so that everyone can celebrate happily. I love that! (Makes me think of when two people get married and they have to create their own traditions.) This is a neat addition to our holiday movie collection. Elena is such a sweet character and she has a heart of gold - something I love my children seeing on screen. 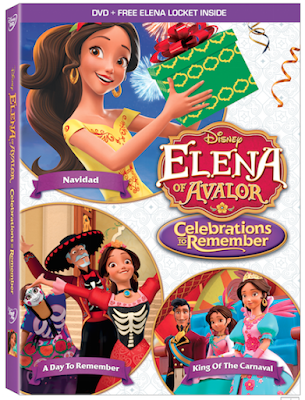 Disney's Elena of Avalor Celebrations to Remember is available at your local retailers and online stores like Amazon.